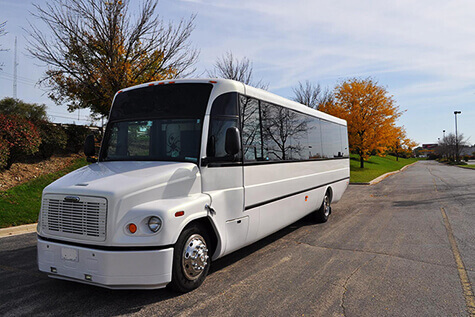 For large groups of up to 35 guests, this bus is a great choice! The two-tone leather seating provides comfortable accommodations for you and 34 guests, while the fun features provide the party atmosphere The color-changing lights paired with the booming stereo will make you feel more like you're at a concert than on a bus, and the built in bar and cooler stations will have you living it up like you're in the most exclusive VIP club with your best friends. You can also enjoy DVDs and playing music from your own CDs, phones, or iPods. This is a great bus for any type of occasion! 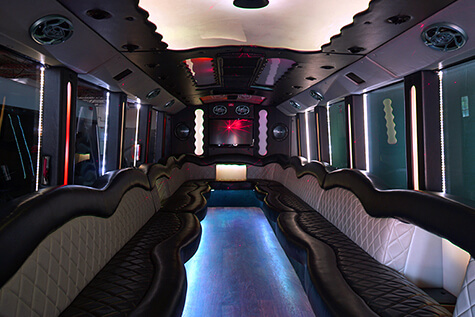 This 34 passenger party bus is a beautiful vehicle and perhaps our favorite of our fleet! 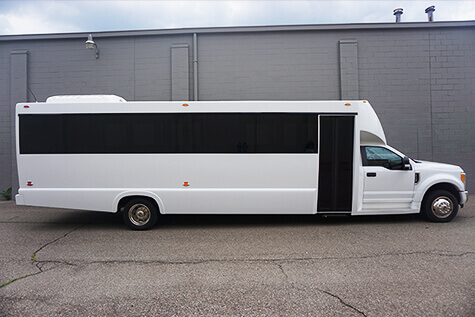 This is a spacious party bus with a white exterior and dark black tinted windows. 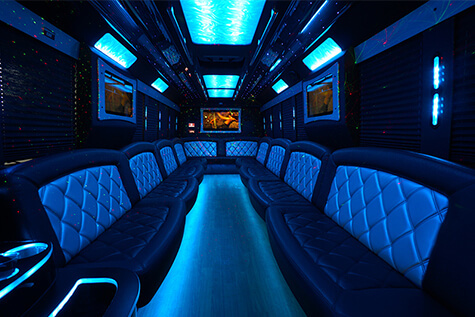 On board you'll find polished dance floors, colorful LED and laser lighting effects, several TVs and a DVD player, a mind-blowing audio system, a CD player, hookups for your iPods or phones, and of course large coolers and counters for chilling and mixing drinks. This bus books up quick, so hurry and call to reserve so you don't miss out on all it has to offer! 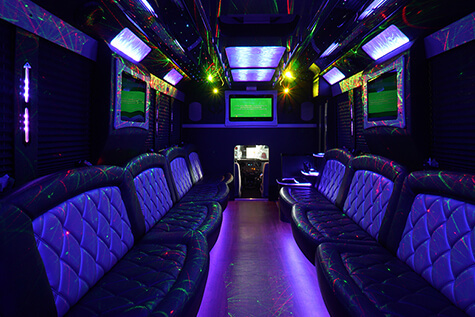 Large groups of up to 30 passengers will enjoy luxurious travel on this party bus! 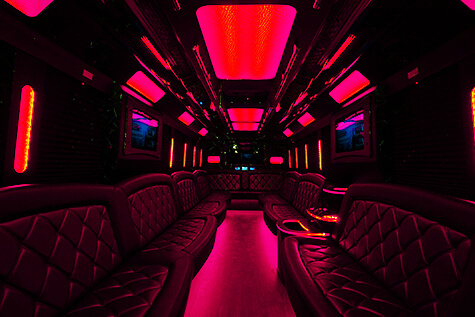 Plush seating, colorful lighting, booming stereos, TVs, and bars are just what you need to get a party bus party started, and you'll find them all on this bus! 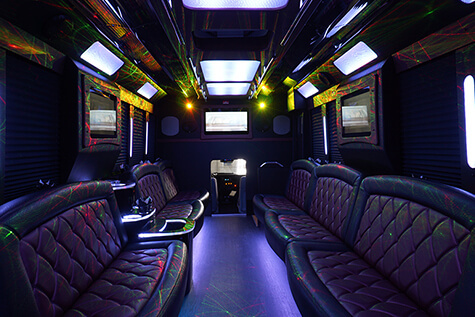 Specifically, two-tone leather seating around the perimeter, color-changing laser lighting, LED ceiling lighting, spacious dance floor, multiple TV screens, a DVD player, incredible stereo system, CD/iPod/ player, and built in coolers are all featured! 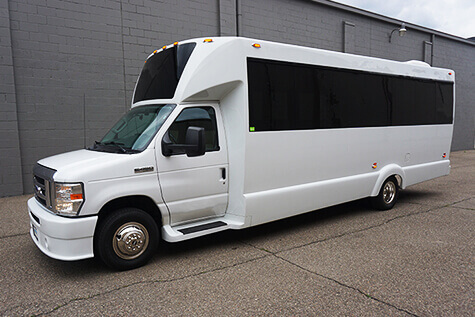 Our 20 to 28 passenger party bus is a great choice for groups of any size, whether you want a super spacious mode of travel for 20 or a comfortable ride for up to 28, this party bus will not disappoint! 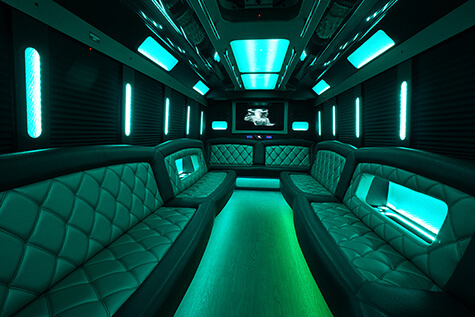 From the multitude of TVs and bars, to the colorful lighting effects, to the music and movie players, you'll enjoy every moment on this bus! The stereo system on this bus will blow you away and because there's no better way to enjoy great sound and a dance floor, you can of course play your own music via CD, iPod, or phone! 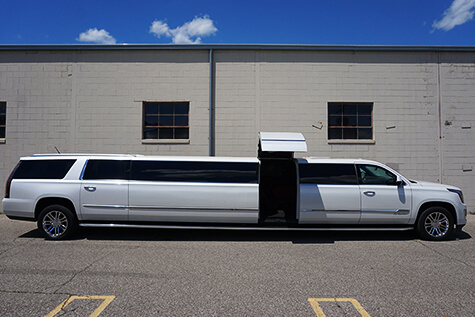 If you're looking for a spacious SUV limousine, then this Escalade super stretch limo for up to 20 guests is just what you need! 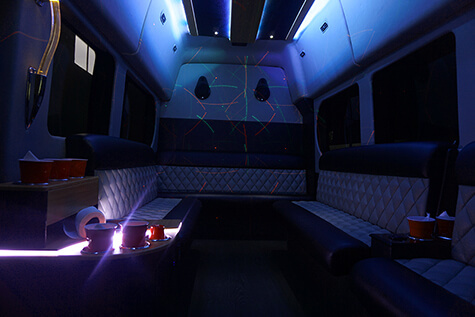 Laser, strobe, and LED lighting effects provide an exciting and colorful interior, the full multimedia package includes a CD player, iPod hookup, Bluetooth connectivity, TV, DVD player, and booming stereo system, the leather seating provides luxury and comfort, and the bar and cooler areas allow you to enjoy your celebration! 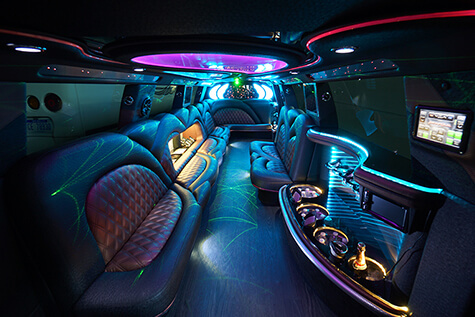 This is a truly incredible limousine and it books up quick, so call today to reserve! 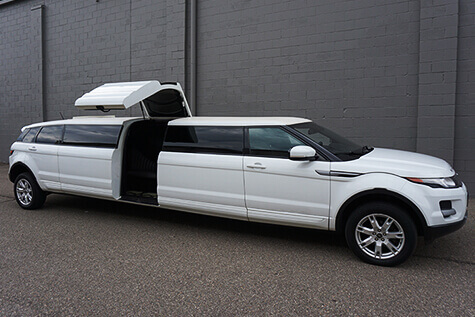 This Range Rover limousine with luxe jet doors provides comfort and style for up to 12 passengers! 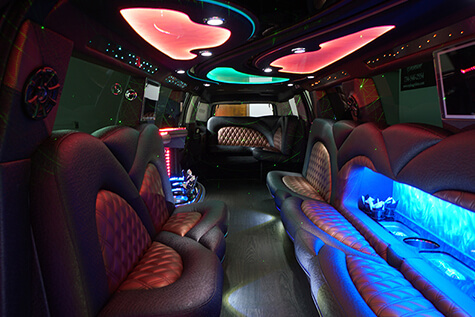 Even though it's one of our smaller limos, it's still a spacious option! 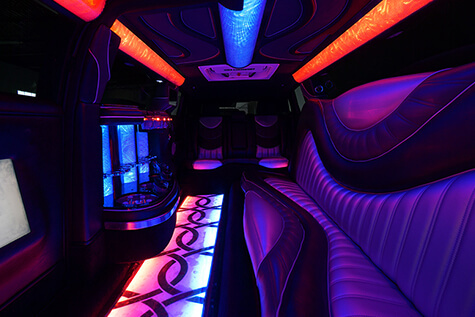 This limo has gorgeous leather seating, a disco floor and ceiling, colorful lighting accents, plenty of cooler space, a CD and iPod player, and much more! 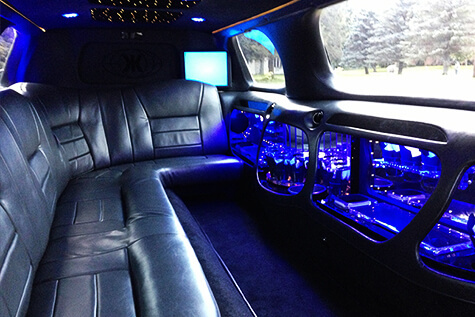 This is one of our most popular limousines and is perfect for anything from weddings to prom to nights on the town! 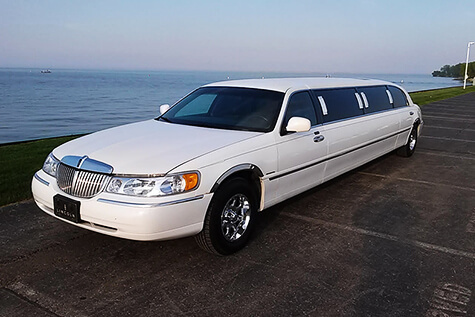 If you're looking for a classic limousine, our white Lincoln stretch limo is just it! 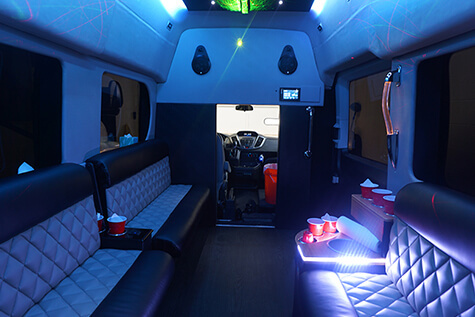 This luxe limo for 8 to 12 passengers has plush leather seating, lovely ambient lighting, a great audio system, TV, large bar/cooler with accent lights, and much more! 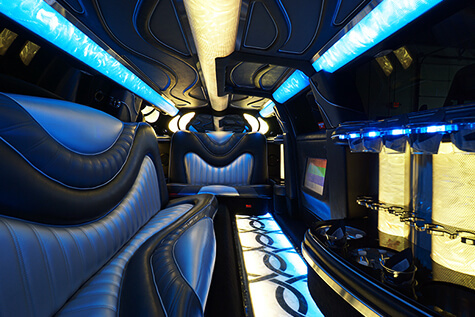 This limo is cozy and comfortable and the epitome of elegance. It's truly a classic limousine! 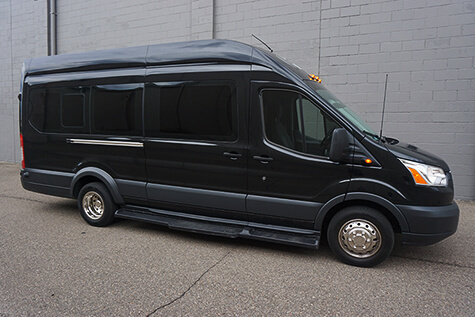 The smallest vehicle in our fleet is our 10 passenger Fort Transit limo van! 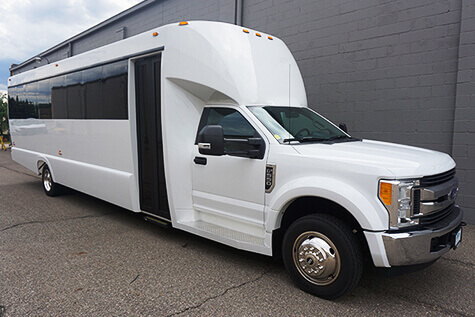 Don't let it's size fool you, this vehicle has an incredible limo interior with custom designs and features! 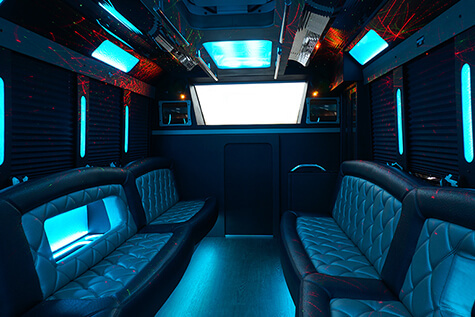 Two-tone leather limo-style seating surrounds the perimeter, laser lighting effects are of course included, there's a large cooler area and plenty of cup holders so all of your guests can drink, and there's all the players and hookups you need to enjoy your favorite music over the newly installed stereo system!